Your home reflects who you are and shares your experiences and tastes. It's meant for entertaining, sharing, relaxing and living—so much more than four walls you merely exist in. Still, identifying your tastes and getting everything just right can be quite a challenge. East Texas Brick can help. We invite you to explore our Courtyard and Patio Center—walk-through environments displaying all the possibilities, from brick and stone, to fireplaces, patio furniture and outdoor kitchens. Come get lost in your imagination and become inspired. Then, allow our experts to help you put it all together to transform your house into a home that couldn't belong to anyone but you. Don’t just reside, thrive. 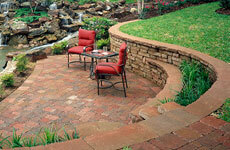 Find the right color and style from our top residential and commercial bricks. We also offer an array of cleaners, sealers, masonry and more. 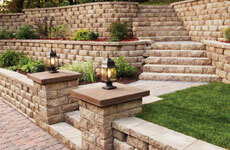 Set your design in stone—natural or manmade. Create the outdoor space of your dreams with retaining walls, pavers, stone patios, outdoor fireplaces and outdoor kitchens. 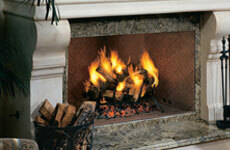 Establish ambiance in your home with a wood-burning, gas, or electric fireplace or stove. Make memories around the beauty and warmth of an outdoor fireplace or fire pit. Exterior details and enhancements set the tone for your whole home. 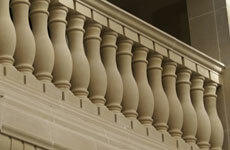 Add elegance and interest to your home with chimney pots, cast stone, roof tiles or copings. Bringing the comfort, style and functionality of your home's interior to your outdoor spaces is simple with help from The Patio Center. 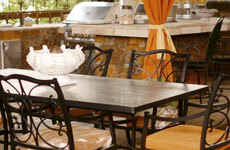 Find furniture and accessories, grills, fire pits, fountains and more to make your outdoor space your favorite place. 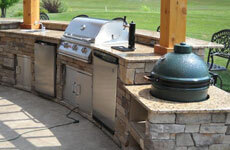 Become a grill master with a Weber grill or Big Green Egg. We also carry a full line of grilling accessories. 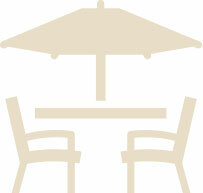 From full patio sets to subtle accent pieces, you're sure to find the right piece, style and material in our extensive selection of outdoor furniture and accessories. 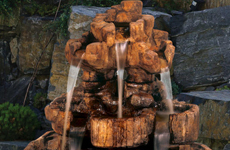 Large, small, ornate or simple, adding an accent fountain to your landscape or garden will bring a calming effect and visual interest to your yard or garden. 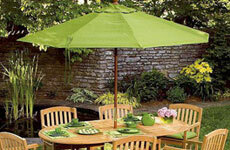 Create shade wherever you want it with large patio umbrellas. We have many colors and styles to choose from.